Do you remember seeing your dad’s calculator that had that strange strip which powered it? Remember how you were playing with it when you asked him to help you solve your maths problem? Wasn’t it fun to keep your finger over the strip and after a time to see the calculator shut down? That was a photovoltaic cell, the thing that makes solar energy possible. What does photovoltaic cell mean? Look at the word photovoltaic and you may be able to guess its meaning. Give it a try. Photo means light, while voltaic means electricity. So how do you think they work? These cells work on the photovoltaic principle, converting light energy into electricity. The sun delivers more energy to the earth in one hour than we currently use from fossil fuels, nuclear power and all renewable energy sources combined in a year. Its potential as a renewable energy source, therefore, is vast. 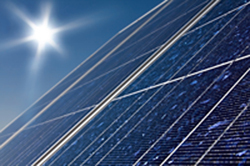 Photovoltaic cells allow us to use the solar energy of the sun to provide electric power. The sun is like a never-ending battery. It provides an important source of clean and renewable energy that is an alternate to polluting fossil fuels like coal. It is the world’s fastest growing technology with the amount of photovoltaic energy doubling every year. In 1839 a French Scientist, Edmund Bequerel discovered that some materials produced small amounts of electricity whenever exposed to sunlight. Think if you were to go camping somewhere. You will find that there are no power sockets to recharge anything! In such remote places a photovoltaic cells come in handy. You can use them in solar panels and also as solar modules. A solar module is when these cells are grouped together and connected in a package in one frame. You might be wondering what the difference between a solar cell and a photovoltaic cell is. Well a solar cell is designed to work in sunlight while a photovoltaic cell can use any form of light to generate electricity. Did you know that the first photovoltaic cell was made to provide power to space satellites. The Russians used them for their Sputnik 3 satellite back in 1957. But even before that, way back in 1839 a French Scientist, Edmund Bequerel discovered that some materials produced small amounts of electricity whenever exposed to sunlight. It was Einstein’s discoveries in 1905 that was the basis of all photo electric technology. Now that we know what a photovoltaic cell is, let us try to understand how these marvellous little things work. These cells are made of a special material called a semiconductor. Silicon is one of the most popular materials used as a semiconductor in these cells. A thin wafer of silicon is specially treated so that it forms an electric field. This field is positive on one side and negative on the other. The photovoltaic material absorbs light rays. These light rays knock loose electrons from the atoms in the silicon releasing electrons in the process. These electrons are captured to release electricity. Two conductors are attached to the positive and negative sides. This completes the circuit and you can tap the electricity created. This is just like how you get electricity when you attach wires to the positive and negative terminal of a battery. A solar cell is, in principle, a simple semiconductor device that converts light into electric energy. The conversion is accomplished by absorbing light and ionizing crystal atoms, thereby creating free, negatively charged electrons and positively charged ions. If these ions are created from the basic crystal atoms, then their ionized state can be exchanged readily to a neighbor from which it can be exchanged to another neighbor and so forth; that is, this ionized state is mobile; it behaves like an electron, and it is called a hole. It has properties similar to a free electron except that it has the opposite charge. Solar cells can be made from single crystals, crystalline and amorphous semiconductors. For simplicity this article begins with a description of crystalline material. Each photon of the light that has a high enough energy to be absorbed by the crystal’s atoms will set free an electron hole pair. The electron and hole are free to move through the lattice in a Brownian motion ; however, on average they will never move too far from each other. When the electron comes too close to a hole during their Brownian motion, they will recombine. On the other hand, when they experience an electric field, this will tend to separate the electrons from the holes; the electrons will drift toward the positive pole (the anode), and the positively charged holes will drift toward the cathode. Recombination will then take place in the external circuit (within the electric wires). Consequently a current will flow. Since it is generated by photons, one speaks of a photo current. And the semiconductor that performs this effect is called a photo conductor. Photo conductors are passive devices. They react to light by changing their electric conductivity. In order to activate them an external electric power source, such as a battery, needs to be supplied to draw a current that increases with increasing light intensity. There are many photo conductor devices in our surroundings; as for example, in cameras, in streetlight controls to switch the lights off at dawn and on at dusk, or for light barriers in garage door safety controls. However, if an electric field is incorporated into the semiconductor, it will separate the electrons and holes. The part of the crystal that accumulates the electrons will be negatively charged; the part that accumulates the holes will be positively charged. The resulting potential difference, referred to as an open circuit, can be picked up by an electrometer. When electrodes are provided at both sides, a current can flow between them. The crystal, when exposed to sunlight, acts as a battery and becomes a solar cell. 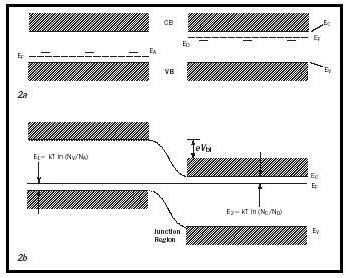 In order to make maximum use of the impinging photons and obtain maximum solar cell output, one has to maximize surface penetration, minimize reflection, and reduce obstacles, such as electrodes. Solar cell efficiency is a most valuable measure of its performance. With sunlight impinging from the zenith on a sunny day, a surface perpendicular to the light receives about 1 kW/m 2 . When converted by a solar cell of 10 percent efficiency (presently reached or exceeded by most commercially available solar panels), this means that 100 W/m 2 in electrical energy can be harvested. This is sufficient if surface areas are ample and the panels are relatively inexpensive. However, where surface areas are at a premium—e.g., on top of a solar car or in some satellites—it is essential to use more efficient solar cells. These are available from carefully engineered Si cells or from GaAs, reaching efficiencies close to 25 percent. As a result, the conversion of inexhaustible solar energy into electrical energy using PhotoVoltaic (PV) devices is one of the most attractive solutions to clean, renewable energy and will transform our future energy options. Photovoltaic power generation is currently dominated by photovoltaic cells that are based on inorganic materials such as polycrystalline silicon, cadmium telluride and copper indium selenide. To make power from photovoltaics truly competitive with fossil-fuel technologies the cost needs to be reduced. New Photovoltaic technologies, such as organic and dye-sensitised solar cells, are emerging from active research and development. 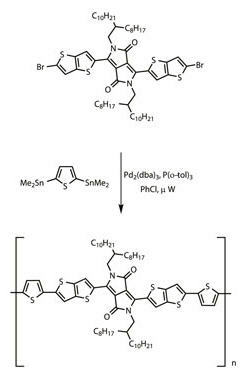 Organic Photovoltaics (OPVs) are a promising cost-effective alternative to inorganic-based PV; and possess low cost, light-weight, and flexibility advantages. Organic molecules such as the polymer have high optical absorption coefficients compared to their inorganic counterparts, and incorporation of polymers of this type into photovoltaic cells offers an attractive alternative to current technology. Creation of complex organic polymers relies on innovative synthetic organic chemistry. In the case illustrated above, the polymer was synthesised from its monomer using a palladium-catalysed coupling procedure. This method of carbon-carbon bond-formation was recognised for its contribution to the construction of complex organic molecules by the 2010 Nobel Prize for chemistry awarded to Professors Heck, Negishi and Suzuki. Cells based on OPVs are currently relatively inefficient due to energy leakage problems and it is estimated that improvements in cell performance, operational stability and fabrication methods are needed to take power conversion efficiencies from the current levels of around 6-8% to a competitive 15%. Organic chemistry provides an opportunity to address this challenge at the molecular level, but it is recognised that the vast parameter space available will necessitate the definition and use of inspired molecular design guidelines. Success will provide significantly lower cost/higher volume manufacturing procedures of flexible devices that in turn will provide opportunities for the production of a wide range of new applications. There is already significant research related to enhancing the efficiency of solar conversion. Solar energy through photovoltaics will be a part of the energy mix of the future. This will require an interdisciplinary approach to generate novel photovoltaic materials and new advanced device concepts that will lead to commercialisation of high-efficiency and low-cost solar cells. Criminals have a taste for Gingerbread and Ice Cream Sandwich. People with devices using the Gingerbread and Ice Cream Sandwich versions of Google’s Android operating systems are popular targets for cyber criminals according to Kaspersky. The security company said in its latest analysis of malware targeting Android, that there had been “a rapid growth” in the number of programs – especially money-stealing Trojans – infecting these operating systems in the third quarter of this year. Yuri Namestnikov, senior malware analyst at Kaspersky Lab said: “Although Gingerbread was released back in September 2011, due to the segmentation of the Android device market it still remains one of the most popular versions, which, in turn, attracts increased interest from cybercriminals. Google’s Android OS has always been a popular target for cyber criminals. The “IT Threat Evolution: Q3 2012” report shows that Gingerbread (Android 2.3.6) accounted for 28 per cent of all blocked attempts to install malware, while Ice Cream Sandwich (Android 4.0.4) accounted for 22 per cent of attempts. More than half of all malware detected on users smartphones turned out to be SMS Trojans. This malware drains money from victims’ mobile accounts by sending SMS messages to premium rate numbers. Of these programs the OpFake family has become the most widespread – 38.3 per cent of all the malicious programs detected for Android – all of which disguise themselves as the OperaMini browser. The Plangton Trojan family accounted for a fifth of all attacks. The malware collects service data on the phone, sends it to the command server and waits for the cyber criminals’ commands. Specifically, malicious programs in this family can stealthily change bookmarks and the home page. The third most widespread malware was the FakeInst family, which mimics installers for popular programs (17 per cent). These two types of malware are mostly distributed via so-called alternative app stores created by cyber criminals. Why I will not go back to Android. Apple’s iPhone 4 and Google’s Nexus One Android phone face off in a battle of apps. The iPhone may be tops on gaming and entertainment, but Android’s social-networking and location-based skills help even the score. Apple has a commanding lead over all other smart phone platforms with 230,000 and counting in the App Store. But Google’s Android platform now claims 70,000. There may be a big difference between the two, but it’s not felt in all categories. In 10 of the most important app categories, iPhone and Android duke it out. Surprisingly, it’s not a total rout, not on either side. Each platform takes its fair share of victories. The iPhone’s huge app count doesn’t help it in certain situations. After all, Apple only just bestowed multitasking to its development community, something programmers have been working with on Android for a couple of years. Also, iPhones don’t run widgets — an extension of an app that appears on an Android phone’s home screen. When it comes to music and social networking, widgets mean a huge advantage. But Android suffers in other ways. Because the OS is freely available to anyone who builds hardware, carriers sell Android phones with a variety of screen sizes and processor speeds. This makes game designers in particular kinda twitchy, especially since they know that a new iPhone will only come out once a year, setting a new top-bar standard when it does. Another developer concern is the overwhelming number of free apps in Google’s disorganized Android Market. According to the mobile apps firm Distino, free downloads account for well over half the apps, including nice ones made by Google itself. If you’re trying to convince people to pay actual money for your apps, it’s better to flaunt wares in the iPhone App Store, where freebies only account for just over a quarter of listed apps. The iPhone has a huge lead here, and most game developers appear to be hanging back from committing to Android for the time being. The biggest exception is Gameloft, which has already published a considerable lineup of Android games including the platformer “Assassin’s Creed: Altair’s Chronicles,” and the first-person shooter “NOVA.” Ironically, Gameloft said last fall that it wasscaling back on Android development, and still refuses to sell apps through Google’s embarrassingly chaotic Android Market, opting to sell through its own website instead. Perceptive reviewers have taken the iPhone to task for not being a very friendly social networking platform. You can set up your phone to get alerts from Facebook and Twitter — sometimes through third-party apps that charge money, like Boxcar — but you can’t really browse your feeds in a comfortable way without diving deep into the apps. Microsoft’s upcoming Windows Phone 7 is built around the idea that your feeds should be visible as soon as possible, with panels that you can assign to your friends, that will aggregate each person’s updates across multiple social media services into one easy-to-find square. As a parent, I have come to think of the iPhone, iPod Touch and iPad as very expensive pacifiers. There are some phenomenal books and educational games being developed for these devices, and anyone who knows they’ll be stuck in a car with a 3-year-old for more than 11 minutes will happily pay for every last one. On the iPlatform, kids’ apps are very high quality — and in the Android Market they’re almost totally nonexistent. Seriously, I can’t find any of my favorite kids’ apps for Android. When it comes to basic media playback, the iPhone still is what Steve Jobs called his “best iPod yet.” Syncing songs, playlists, TV and movies — even rented movies — through iTunes is easy despite the program’s famous bloat. And once the media is on the iPhone, it’s easy to access and manage (as you can see in the presumably familiar image at right). For people who own their own music and movies, it’s unparalleled. Though photo syncing is best performed through Apple’s iPhoto, another bulky Mac program, it too provides unparalleled organization. When it comes to streaming music and new music-on-demand services, Android suffers no disadvantage. All the popular iPhone music apps — Pandora, Slacker, Rhapsody, Mog, and even utilities like SoundHound and Shazam — they’re all available on Android too. The difference is, most of them get widgets in Android. Pop open your phone and flip through tunes, ditch one service for another, hell, play two or three songs at the same time from the same screen in some freaky mashup performance piece, all without dipping into an app. You can’t do that on an iPhone, but if you’re half crazy, you’d definitely do it on an Android phone. I read every night on my iPad, but I’ve never read more than a page of a real book on any phone. Still, the arrival of e-book apps on smart phones is a big buzz maker, and Android is, as of this week, essentially caught up to iPhone. When it comes to marquee e-book apps, both platforms have Amazon’s Kindle, Barnes & Noble’s Nook (at right) and Kobo, which is supported by Borders. Android doesn’t have Apple’s iBooks, obviously, and Apple is bound to grow it and possibly even release it for other platforms. Still, you’d be out of your mind to spend money on iBooks now, when the other services are accessible from such a broad variety of gadgets, including iPad, iPod and iPhone.